It's all too common for drivers to select the lowest limits legally permitted when configuring a liability auto insurance policy. While the policy may comply with the letter of the law, such small coverage payment limits are rarely enough to cover all the costs of an accident. When that happens, the parties not at fault for the accident are then stuck with the bill for whatever damages the at-fault driver's policy could not cover. Underinsured motorist coverage was designed to insulate you financially from these types of situations. Underinsured driver coverage essentially closes the gap between the full amount of your accident-related damages and what the at-fault driver's payment limits would cover. The coverage will reimburse you for the medical expenses, pain and suffering, and lost wages for which the other driver's policy could not pay. The protection extends to the passengers in your vehicle at the time the accident occurred, as well as any people listed on your auto policy if they are involved in a collision with an underinsured driver. Carriers typically describe the coverage by its limits per person and per accident (e.g., $25,000/$50,000). Assuming your state does not require the coverage, the amounts of the limits are up to you. Some states, such as Virginia, also have a deductible for underinsured motorist coverage. 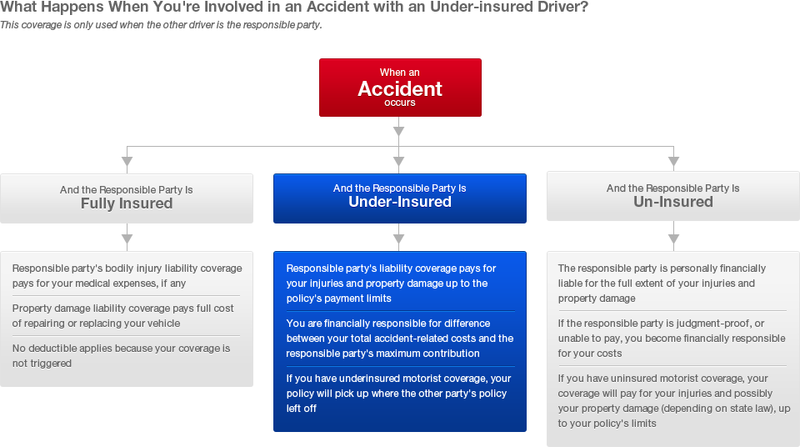 Do You Need Underinsured Driver Coverage? A handful of states have laws requiring drivers to carry at least a particular amount of underinsured motorist coverage. Most states, however, do not require the coverage by law, so it is by and large an optional protection. Given the amount of protection the coverage offers for such a small price, though, almost all drivers would do well to add it to their policies. Recent insurance industry statistics reveal that one in six American drivers is without any insurance coverage, and the number of underinsured drivers is likely astronomically higher. If an underinsured driver ever hits you, you would be financially liable for whatever damages his/her policy cannot pay, and that amount could be substantial. For just a slightly higher premium, you can have the peace of mind of knowing your policy will make up the difference if that ever happens. State law determines the specifics of what underinsured driver coverage can and cannot pay for, as well as the amount the coverage pays. Some states allow underinsured motorist coverage to pay for property damage as well as personal injuries, while others limit the payments to only medical bills, pain and suffering, and lost wages. The amount of the benefit you will receive from the coverage will also vary by state. The majority of states allow the insurer to pay the difference between the contribution of the at-fault driver's insurance policy and your total accident-related expenses. On the other hand, a small number of states require the insurer to pay the full amount of your damages, regardless of what the at-fault driver's policy may have contributed.